The Grand Prix of France took place this week-end in Issy-les-Moulineaux with a strong field of 162 players coming from 11 nations. Besides the 54 French players, there were 108 foreign players. In the Open category, the top seed was the current world champion Juan Noguera. The player from Spain was defeated in the semi-final by Belgium’s Christophe Dheur. Dheur later beat Sami Targui in the final to claim the title (1-0). Maikel de Haas from the Netherlands was the other semi-finalist. There were many big games in the veterans section. World number 1 Gianfranco Calonico had a perfect road to the final but in the last game, Patrick de Jong from the Netherlands tied 2-2 and finally took the title on shots. Françoise Guyot from France won the ladies category, defeating Audrey Herbaut in the final. 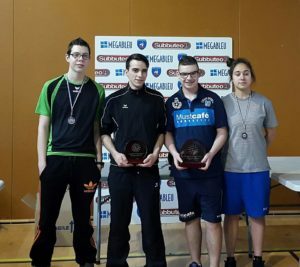 In the other categories, the titles were awarded to Belgium’s Florian Giaux (U19 – picture), Italy’s Nicola Borgo (U12) and Belgium’s Corentin Bouchez (U12). On sunday 30 teams attended the club tournament. SC Charleroi took the honor after beating Fiamme Azzurre in the final. The Belgians made a great tournament, managing to qualify their second squad for the semi-final as well. Congratulations to the organizers for a great tournament. This entry was posted in FISTF News and tagged France, Grand Prix, Results. Bookmark the permalink. ← United in dramatic win!